Wildcuts Salon, the new cosmetology classroom at Warwick Valley High School, celebrated its grand opening Jan. 25. Cosmetology teacher Kathleen Bettello welcomes visitors to the Wildcuts Salon. This school year, the High School added Cosmetology to its growing Career and Technical Education (CTE) program. Wildcuts Salon – the Cosmetology classroom – boasts hair styling stations and offers haircuts, manicures, makeup, and other services. Thursday’s grand opening included a traditional ribbon cutting ceremony hosted by the Warwick Valley Chamber of Commerce. 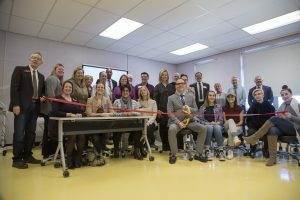 Special guests included chamber members; Michael Johndrow, the Chamber’s executive director; the Warwick Valley Board of Education, District administrators, and students. Superintendent Dr. David Leach cuts the ribbon and officially opens the Wildcuts Salon. Justice and Video Production. Previously, students had access to these CTE classes, but had to travel to Orange-Ulster BOCES in Goshen. With newly expanded CTE offerings now on campus, students can remain in the High School and take advantage of other opportunities. Cosmetology students Andrew Redman, left, and Nina Kambac are among the first to attend classes at Wildcuts Salon. When deciding which programs to offer at the High School, administrators assessed Warwick Valley students’ participation and interest in CTE. 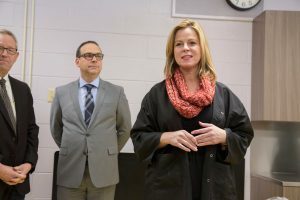 Some programs, such as plumbing and auto repair, weren’t practical to consider, but converting existing classroom space into a hair salon, a police bureau, and a video production studio was within the District’s capabilities.